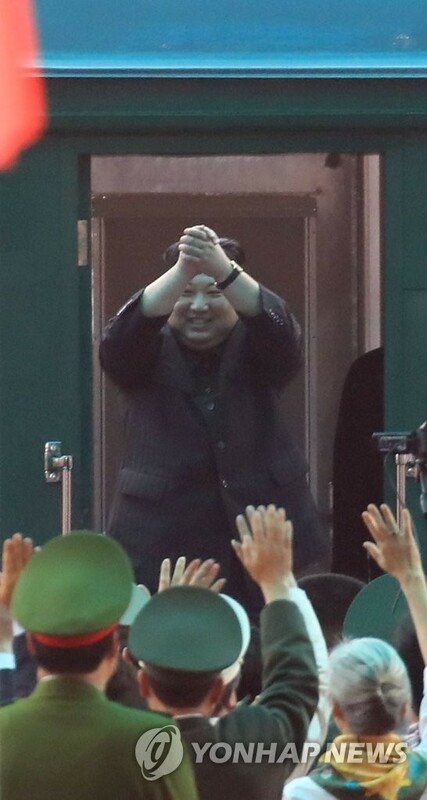 HANOI/BEIJING, March 2 (Yonhap) -- North Korean leader Kim Jong-un left Vietnam by train on Saturday after failing to produce a deal in his much-anticipated nuclear talks with U.S. President Donald Trump. After a two-and-a-half hour drive from Hanoi, he arrived in the Vietnamese border town of Dong Dang at around 12:30 p.m. (local time). About 10 minutes later, a train carrying Kim and his entourage departed the station there to cross into China. He was seen off by a group of high-ranking Vietnamese officials. The train was later seen passing through the stations in the Chinese towns of Pingxiang and Nanning on its way northwards. Though it is not clear yet whether Kim will make a stop in Beijing to meet Chinese President Xi Jinping to discuss the outcome of his summit with Trump, many have forecast that Kim will go straight home following the fruitless meeting. If his train continues to travel at the current pace and on the widely expected route, it is likely to arrive in North Korea early Tuesday. Contrary to expectations, he didn't stop in Beijing on his way to Vietnam. His train instead took the shortest route. Kim's train arrived in Vietnam on Tuesday after nearly 70 hours of travel from Pyongyang through the central region of China. A source in Beijing said that a hotel in the Chinese border city of Dandong overlooking a bridge linking China and North Korea will stop receiving reservations until Tuesday. The hotel stopped receiving bookings for apparent security reasons when the North's leader traveled across the border. Kim and Trump held their second summit in Hanoi on Wednesday and Thursday to discuss the dismantlement of North Korea's nuclear program but the high-stakes talks ended without an agreement. The leaders were expected to flesh out a June summit agreement frequently criticized for being long on promises but short of concrete steps. 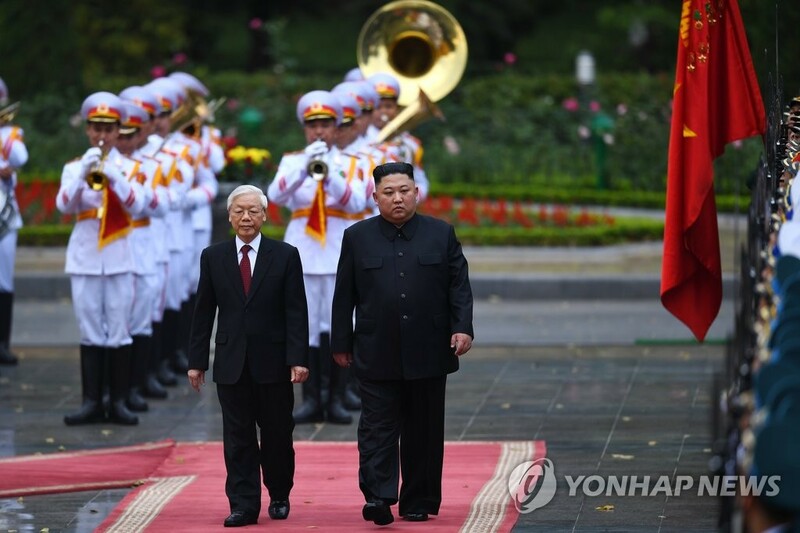 After the nuclear talks, Kim started his two-day official visit to Vietnam by meeting top Vietnam officials, including Vietnamese President Nguyen Phu Trong, on Friday. North Korean state media reported that Kim expressed hope for stepped-up cooperation and exchanges between the two countries in all areas and for upgrading bilateral ties. Kim is the first North Korean leader in 55 years to make a visit to Vietnam following his late grandfather and founder, Kim Il-sung, who traveled to the country in 1958 and 1964. Kim paid tribute at the Ho Chi Minh Mausoleum earlier on Saturday before taking his special train in the Dong Dang station.